The word “mandala” loosely means “circle” in Sanskrit. 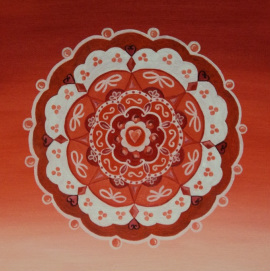 However, there are several deeper meanings to the idea of a mandala and what it can represent to each individual person. From the past to current times the mandala has and is used for helping to guide one during meditation for healing, and for personal growth. Mandalas have been seen in many different cultures and religions over time. From Hinduism, Buddhism, Christianity, Islam, Native American, Aboriginal Australia to even patterns in nature such as snowflakes, rings in trees, shells, and atoms. In nature, mandalas remind us that there is a “divine designer” and that as unique as each mandala is, they are also connected to form the “bigger picture”, just as human beings are. 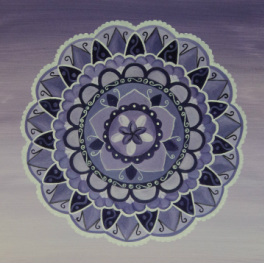 For me personally, mandalas represent a powerful tool for transformation. In fact, the word mandala is also used as a term for ones “container of essence." Basically, on an aesthetic level, it contains what each of us put into it from ways we view the world to what we see ourselves as. Carl Jung believed that mandalas are snapshots of the subconscious and that when we work on our issues we create wholeness in character. It also represents the circle of life. Chakras are energy centers located along the mid-line of the body. When I read people's energy I focus on their chakra energy to connect to their inner-self. There are seven, starting from the root to the crown. Each one helps in our functioning and our emotions. When they are opened they help create balance in our energy and lives. It is ideal for the charkas to be balanced to help reach our potential as human beings. 1) Root Chakra (red)- is connected with being physically “there”, grounded, stable, and secure in different or new situations, present in the here and now and connected to your physical body. 2) Sacral Chakra (orange)- is connected with feeling and sexuality, openness to intimacy, passionate and lively. 3) Navel Chakra (yellow)- is connected with self-esteem, feeling in control, and asserting yourself when needed. 4) Heart Chakra (green)- is connected with love, kindness, and affection. Also compassion and friendly, working at harmonious relationships. 5) Throat Chakra (blue)- is connected with communication, self-expression , talking, expressing yourself, and creativity. 6) Third Eye Chakra (indigo)- is connected with insight, intuition, visualization, and psychic abilities. 7) Crown Chakra (violet)- is connected with wisdom, being one with the world, and being open-minded.